I have this great cookbook that a friend I had for a short time gave me as a gift. I have tried many of the recipes in it and I haven’t found one that has turned out bad yet. It has great appetizers and soups and pasta dishes and it is as the title promises, quick from scratch Italian. Two of my favorites that I make quite often are the gorgonzola fettucine and the Sicilian meatball stew. The other night I was trying to figure out what to make for dinner and looking at the plethora of zucchini I had on my counter, thanks to my personal produce aisle in my back yard. I remembered seeing two great zucchini recipes in my book, one for a grilled zucchini style caprese, to change it up by using zucchini instead of tomato, and the other was for a zucchini fonduta. I was not sure what the heck fonduta meant. But after making it and listening to the pronounciation as I say it in my Giada Italian accent, I realize it is just the italian way of saying Fondue. In my cookbook they call this a divine rendition of mac and cheese. In a heatproof bowl combine the cheese and the milk. Let sit for about 20 mins and drain off milk, reserving 1/4 cup. Set the bowl with the cheese over a saucepan of barely boiling water or transfer the cheese to a top of a double boiler. Whisk until the cheese melts (about 5 mins). In a separate bowl whisk together reserved milk with egg and butter. Add to the melted cheese over the boiler (make sure the water is just barely simmering, not too high). The mixture will separate. Whisk until the sauce is almost smooth and add the salt and pepper, it will take about 3-4 mins. Do not cook too long or over too high heat or the mixture will curdle, it is ok, the sauce will not be completely smooth. Meanwhile in a pot of salted boiling water cook fusilli for 10 mins and add zucchini and bring back to a boil. Cook for about 3 mins till the pasta and zucchini are done. Drain and toss with fonduta and enjoy! 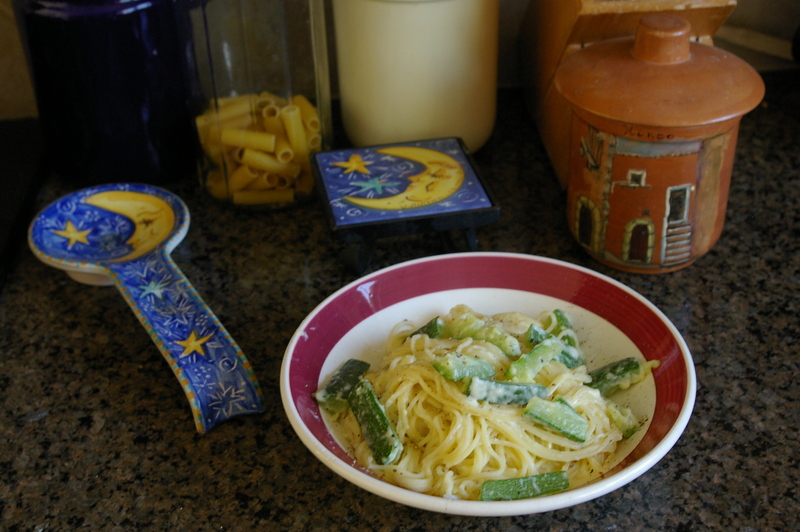 You are currently browsing the What Tara's Cookin' blog archives for July, 2010.